The meeting location for May will be determined at a later date. This site was created for current and future residents of the Rudgear Estates neighborhood. We are nestled within nearly 30 acres of beautiful open space in south Walnut Creek. Rudgear Estates consists of 429 homes built by Whitecliff Homes in 1973, many of which back up to the rolling open space hills. Residents enjoy hiking and biking on the several trails that originate from the local streets. The streets are safe and well-lit providing for safe easy walking and jogging. The well-appointed Rudgear Park is an easy walk from all homes and the local pool is an outstanding asset for all to enjoy. In this site you will find important information about our Community Pool, Calendar of Events, the Management Team, the Board of Directors, public documents critical to the operation of the Homeowners Association including Minutes from past Board Meetings, useful local community links and much more. The Association was founded to help insure all our community areas are properly maintained. This web site is for the benefit of all residents and is intended to help share information about the Association in an efficient manner for the benefit of the Membership in partnership with the Board of Directors and the Management Company. It's also to assist any new or prospective members of the community to gain a better understanding and appreciation for what Rudgear Estates has to offer. Please take a few minutes to become familiar with the web site. We also welcome and encourage your constructive feedback and suggestions. One of the unique features of our neighborhood is the large areas of community open space surrounding our development. 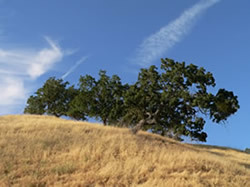 Seeing the oak tree spotted hills while walking or driving on the streets within Rudgear Estates is a special feature we are fortunate to share. At the end of Whitecliff Way one may choose the high road or the low road and be guaranteed an invigorating journey into the wilderness.